posted: September 02, 2017 by: Jennifer Kvamme, DVM Tags: "Clinic Specials" "News"
Fleas and ticks are a year-round nuisance for most of us but, when it comes to the infestations of our yards and our homes, the fall seems to be a particularly terrible season. Here are few areas fleas and ticks like to hide and how to best limit your pet’s exposure to these pesky parasites. The autumn season is probably best known for the beautiful changes it brings to the colors of leaves just before they begin to fall to the ground. Though they may be a pretty sight and a blast for kids (or pets) to play in, leaf piles can also be a haven for fleas, which prefer to congregate in humid areas away from bright sunlight. Solution: Rake up fallen leaves regularly and immediately bag and dispose of them in a secure trash receptacle. Ticks love to climb up tall grasses so that they can grab onto a passing animal or human. Solution: Mow your lawn regularly and trim back branches so they don’t jut out toward walking areas. Does your pet frequently sleep outdoors or do you leave out food and water bowls for them? Fleas and ticks recognize these high traffic areas—whether they are trafficked by your pet or a wild animal like a raccoon or possum—and lie in wait until they can latch onto a host. Solution: Regularly clean out sleeping areas, especially if there are pillows inside. Also, if possible, remove food and water bowls after your pet uses them and/or before nighttime. Raccoons and possums are opportunistic feeders and will eat or drink anything left out. They also are frequently teeming with ticks and fleas. What if My Pet Doesn’t Go Outdoors Much? Even if your dog stays close to home, fleas and ticks are canny creatures, and they have ways of making it into your home and onto your pets, even with preventions in place. 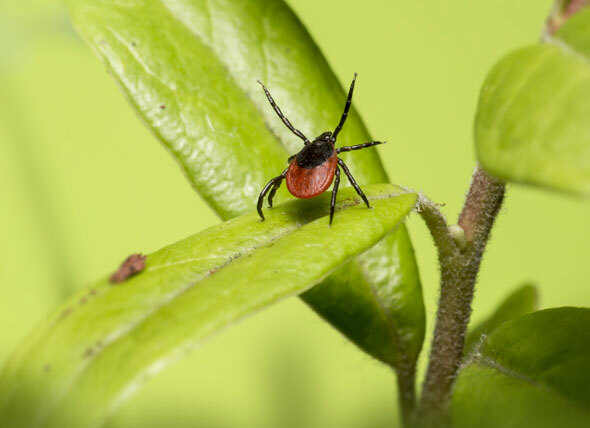 All it takes is a few fleas or ticks to get established in your yard before you have a full-scale infestation on your hands. Visit your veterinarian for advice on the best preventive medications and the safest way to use them. Your doctor will be able to show you the proper way to apply these medications and recommend just the right dose for your pet’s age and weight. Some people also choose flea and tick preventatives based on their personal preferences or the lifestyles of their pets.